Central Boiler® offers a wide variety of furnaces including the CL 4030, CL 5036, SCL 5036, CL 6048, SCL 6048, CL 7260, and the Pallet Burner. In addition to the wide variety, all furnaces can come in 9 different colors. Because we want you to make the best decision for your location, feel free to use our sizing guide (155 KB, PDF) to choose the best sized furnace for your needs. If you have any questions at all, feel free to call us at (218) 346-6705. *Replaces up to 250 gallons of fuel oil per month. *Replaces up to 500 gallons of fuel oil per month. *Replaces up to 1,500 gallons of fuel oil per month. *Heating capacity similar to the CL 7260.
by Central Boiler® Classic furnace owners. 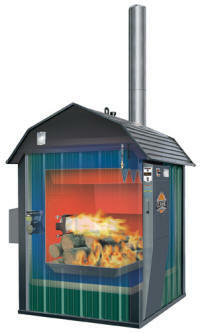 **Btu ranges vary widely with different types of wood. Because of property owner's varying tastes when it comes to color preference, Central Boiler® outdoor wood furnaces are available in several color options. 2. Ripple Top® heat transfer for ultimate heat extraction. 3. Insulated, cast iron door. 5. Skid base, no concrete base needed. 6. Vent design eliminates evaporation. 7. Type HT listed, factory built, all stainless chimney. 10. 100% airtight, waterproof urethane insulation. 11. Tapered ash pan for easy cleaning. Fan Draft option available for all models. Dual Fuel Models allow you to burn, in addition to wood, LP, natural gas, and fuel oil (of the right viscosity). The Dual Fuel option has four different modes: wood only, clean start, Dual Fuel Backup, and Fuel Oil- LP/NG.